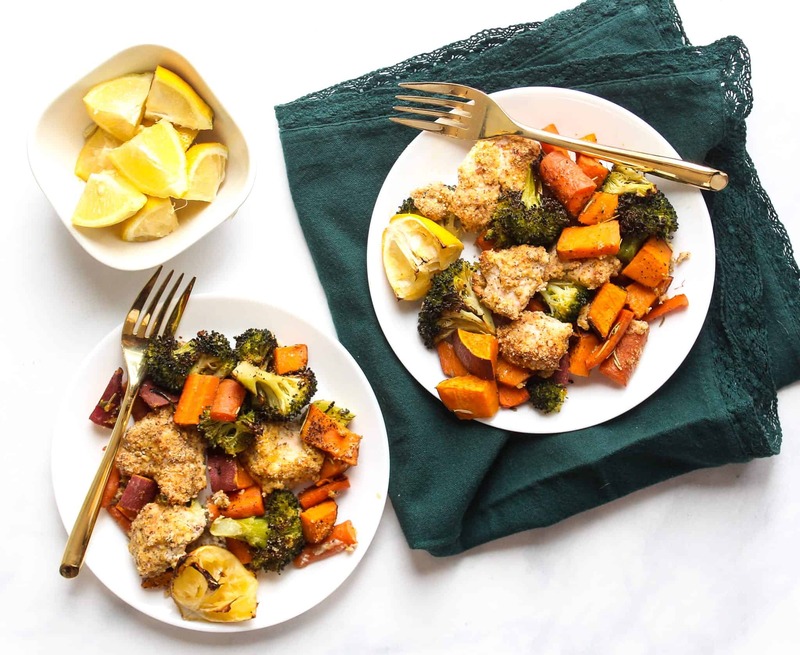 Sheet Pan Baked Almond Chicken Tenders and Roasted Vegetables is an easy and satisfying meal that requires minimal time and clean up! 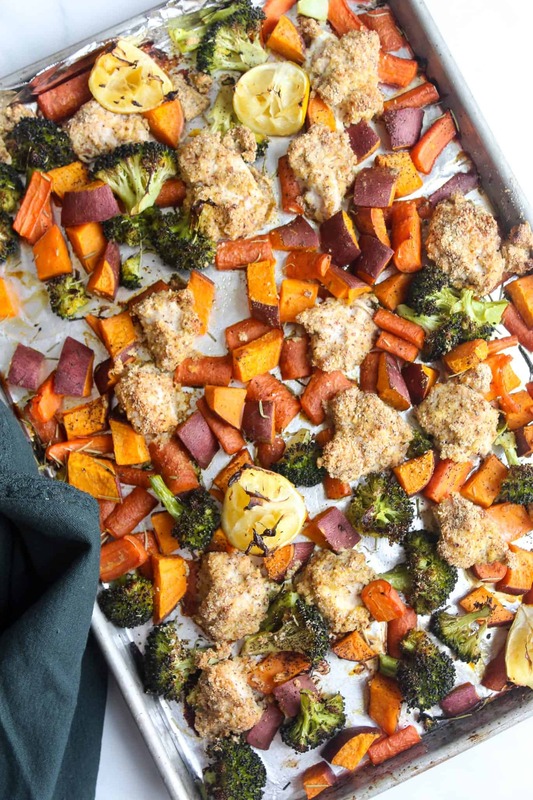 Pin Sheet Pan Baked Almond Chicken Tenders and Roasted Vegetables here! This past weekend, Brian and I visited Colorado and had an amazing time! If you are new around here, we actually lived in Colorado for 2.5 years while Brian was in residency and that is where I completed most of the schooling for my program to become a Registered Dietitian. We now live in Indiana close to both of our families BUT we miss the Colorado lifestyle every single day. While I am not one to typically fall into trends, this whole “sheet pan meal” is totally a trend I have latched onto. 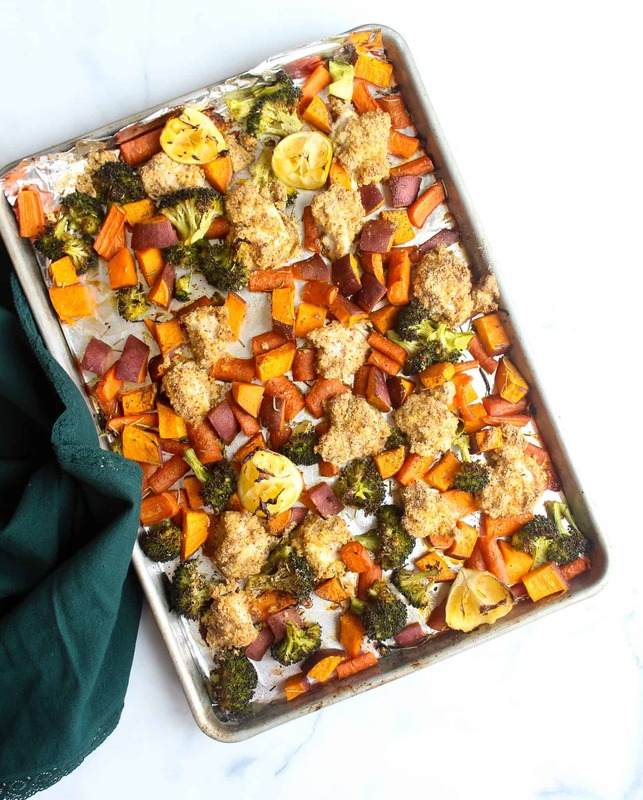 Have you tried making a sheet pan meal yet? They are so simple, require minimal clean up and ROASTING the vegetables makes them taste seriously delicious. 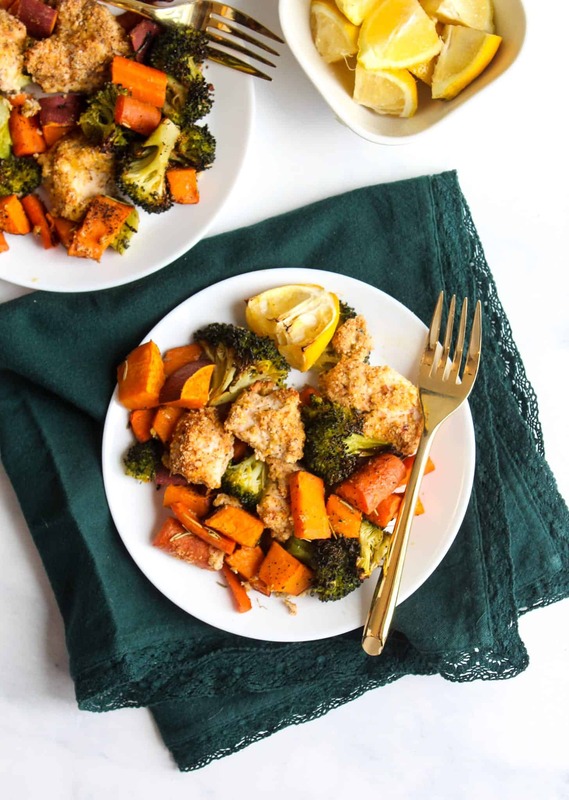 This sheet pan dinner is a variation of my Baked Almond Chicken Tenders. I added some lemon for a yummy bright flavor and vitamin C boost and tossed my veggie side on the pan so it would all cook at the same time. Dinner is ready in no more than 40 minutes…can’t beat that!! For this recipe, it helps to have all the ingredients prepped and ready to go before you start mixing things together. Broccoli: super hydrating (almost 90% water), high in fiber and is a natural cancer protectant due to plant compounds. 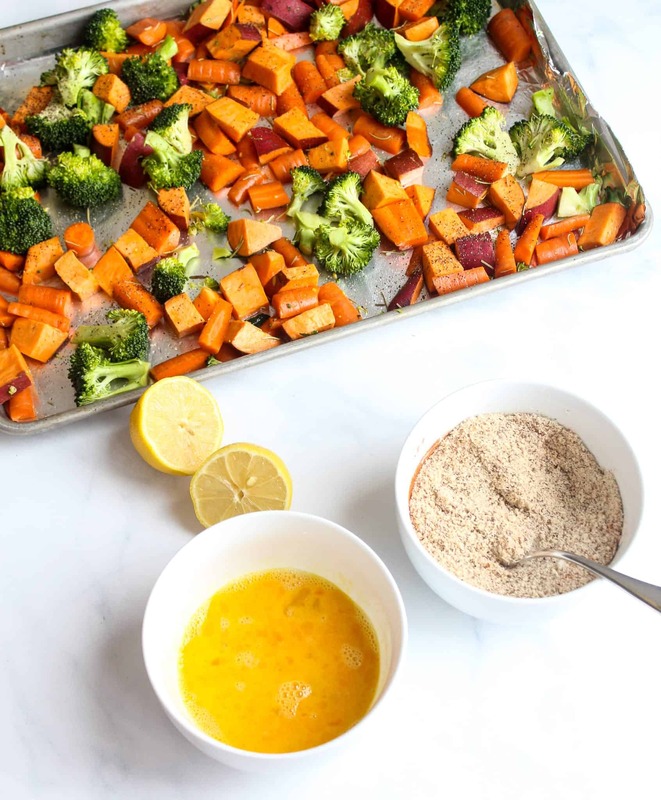 Sweet Potatoes: great source of vitamin A, which is linked to our eyesight and many other processes in the body as well as vitamin C.
This dish is naturally gluten free and dairy free. For those concerned with FODMAPs, this dish is made with ingredients in amounts compliant with the Monash University App. It has not been tested for FODMAP content. Looking for other sheet pan meal inspiration? Preheat the oven to 400 degrees Fahrenheit. 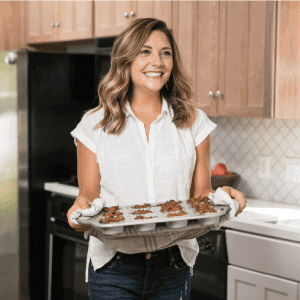 Line a rimmed baking sheet or sheet pan with aluminum foil and spritz with olive oil cooking spray. 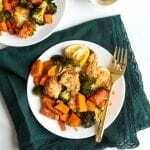 Slice the chicken breasts into small bite-sized pieces, similar in size to the vegetables in your meal. In a small bowl, combine the almond flour, salt and smoked paprika. In a separate small bowl whisk together the egg and the lemon juice. Take one piece of chicken and dip it into the scrambled eggs/lemon mixture, then dip it into the almond flour/meal. Place the breaded chicken on the prepared baking sheet and repeat with the rest of the chicken. Place the vegetables (all cut to a similar size) in a large bowl. Toss with olive oil, rosemary, salt and pepper until everything is evenly coated. 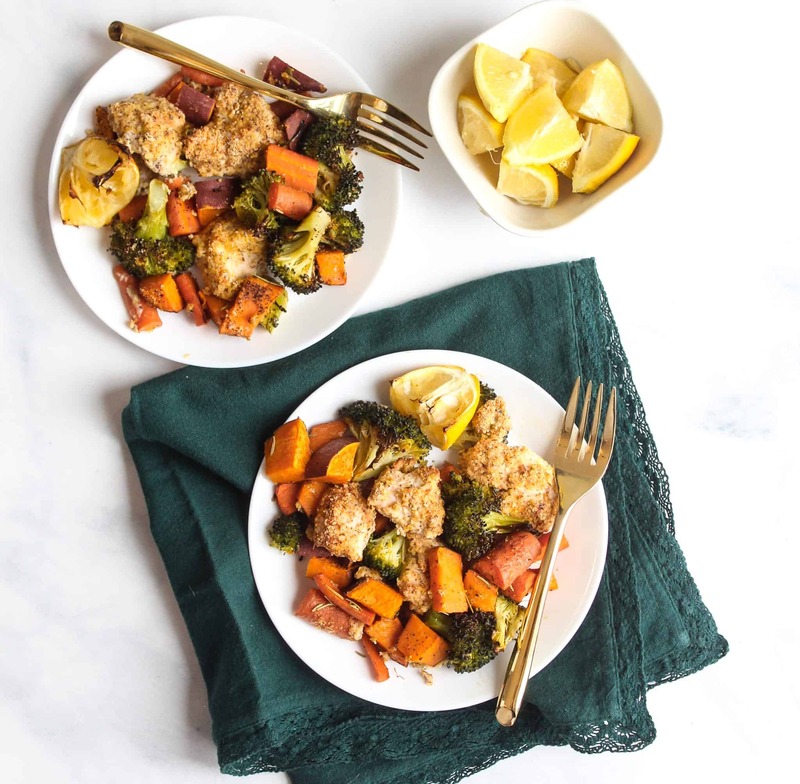 Arrange the chicken and vegetables on the sheet pan so minimal items are overlapping. Bake at 400 degrees for about 25 minutes, or until the chicken is 165 degrees Fahrenheit and the vegetables are slightly crisp on the outside and tender on the inside. This recipe has not been tested for FODMAP content, but all ingredients are used in compliance with the Monash University App. *You will have leftover egg after dredging the chicken. **You will have leftover almond meal after coating the chicken. What is one fun thing you did this weekend? Some people who read your blog live in the southern hemisphere where it is now summer and definitely TOO HOT for sheet pan meals. Could you please suggest a seasonal alternative occasionally?